Posted on September 20, 2014 by Amanda W.
A. F. Wendling’s has teamed up with Blackwater Brewing Company to bring a unique, locally-made product – Kolsch Bier Bratwurst! The new bratwurst starts with Blackwater Brewing Company’s Canaan Valley Kolsch, a traditional German Pilsner. When added as an ingredient in the processing of bratwurst, the residual sugars of its malty backbone impart a subtle, sweet balance to the core of the flavor. Hop oils present in Kolsch accentuate and round out the spice components of the bratwurst. 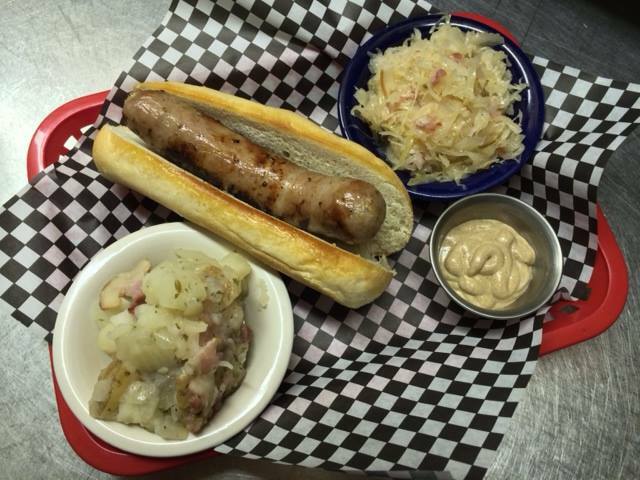 Blackwater Brewing Company is proud to offer Wendling’s Kolsch Bier Bratwurst served on a lightly toasted bun with Dusseldorf mustard, paired with home-made German potato salad and kraut. Enjoy this special for only $10.95. Wash it down with our Canaan Valley Kolsch or Mountain Marzen. We’re also offering Southwest Chicken Chili served with fresh-made tortilla chips for only $9.95. Our Laurel Run EPA is sure to compliment this hearty soup. Don’t forget to ask about our logo stainless steel growlers. Only way to take your favorite Blackwater Brew to go. This entry was tagged Blackwater Brewing Company, Canaan Valley Kolsch, Kolsch. Bookmark the permalink.